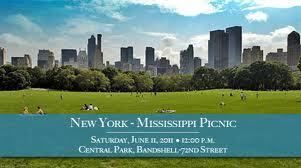 “Find Your True South” and celebrate Mississippi at the 32nd Annual New York-Mississippi Picnic in Central Park. The picnic will feature many of Mississippi's most talented artists displaying and selling their artwork, Mississippi writers signing their books, as well as the ever-popular delicious southern cuisine featuring a "Taste of Mississippi." Bring a blanket, kick back, relax and enjoy down home Mississippi blues music straight from the Hospitality state being performed by Mississippi's own, Eddie Cotton. Jon Paris will be on hand to perform his "always a hit music" at the picnic as well! For more information about the picnic, please contact Rachel McPherson at (718) 788-2988, or e-mail NYMSPicnic@yahoo.com.